Stefan Joubert is now accepting appointments for Rock guitarists in London. If you are a Rock guitarist now or want to be one, and you are looking for some excellent training in London, now is the time to reserve a place with one of the leading Rock guitarists in the field, Stefan Joubert. 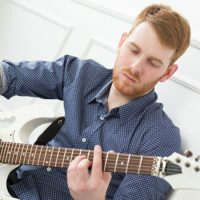 Stefan runs the London Guitar Institute in London and is now accepting students who want to start or improve their knowledge and skill level with the Rock guitar. The Rock guitar courses in London are designed for each level of skill: Beginner Rock, Intermediate Rock, and Advanced Rock. Rock guitar courses in London have never been offered like this – with lessons designed for the individual, taught by a renowned master player and teacher, held in convenient locations, and reasonably priced. Stefan has worked under master guitarists himself, and received recognition from some of the world’s best players. In the world of Rock guitar playing, Stefan knows all the variations of Rock music and the rich history and cultural heritage that inspired it. Learn to play the styles some of the greats in the Rock genre like Slash, Jimmy Page and Led Zeppelin or The Eagles. Learn about Eddie Van Halen’s hard rock style or Jimmie Hendrix’ bluesy style. There are many legends in Rock guitar. Let Stefan introduce you to them and their styles. Stefan Joubert can bring this history of Rock culture to you and help you feel the artistic nature of Rock and all that it represents. As a Rock guitarist in London, you will have a new appreciation of the genre. There are two locations for Rock guitarists in London to take courses. Rock guitarists seeking courses in London should have the finest accommodations available to them. The London Guitar Institute is renowned as a first-class teaching and learning venue. Rock guitar courses at the London Guitar Institute follow a path of progressions to enable you to achieve the skill level you need, working at your own individual pace. We start with the nature of the guitar – how it works, why the tuning dictates the system, how to understand the system, string groups, and much more! Having a solid understanding of how the instrument operates from a scientific point of view will definitely help you tremendously with your rock playing in the future! We will spend a considerable amount of time in the early days working on your technique. We will work on right hand and left-hand techniques, and you will become an expert at all the various important elements of playing rock guitar. Some examples include: vibrato, pull-offs, hammer-ons, tapping, speed picking, sweep picking, slides and much more! Knowledge – once you have developed a strong technique, we will delve deeper into the realms of musical knowledge. You will discover the 7 modes of the major scale, namely the Ionian, Dorian, Phrygian, Lydian, Mixolydian, Aeolian, and Locrian mode and get to know the pentatonic scale inside out. You will also develop extensive chord knowledge and learn how to solo using arpeggios and chord tones! 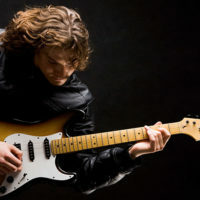 While you are acquiring excellent technique and musical knowledge, we will explore classic rock solos such as Slash’s solo on “Sweet child o’ mine,” or Led Zeppelin’s “Stairway to heaven” or the all-time favourite from the Eagles, “Hotel California.” You will learn a tremendous amount about rock guitar by analysing your favourite rock guitar solo! You will then learn how to play with emotion and ‘true rock and roll’ feel! We will then explore a lot of improvisation and discover how to improvise using all the knowledge elements of rock guitar that has been mentioned in point 3. At this stage, your technique should be more than adequate to start improvising. There’s a lot of tricks of the rock and roll trade when it comes to improvisation, and that’s exactly what you will learn! You will then learn how to believe in yourself and become the rock guitarist you can possibly be! You will also learn how to master the fretboard and become very proficient at playing rock and roll guitar. At this stage, you will explore advanced techniques and methodologies such as melodic superimposition when you solo over the harmony! 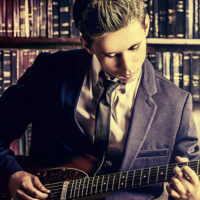 And finally, you will develop your own unique rock tone and perform and impress everybody you know with your amazing rock ‘n roll guitar skills! Yes, at this stage – it is a dream come true! We will give you the training and personal and professional advice that will be invaluable to you as you move up through the levels of skill and performance. As Rock guitarist seeking courses in London, you are eligible for training at the London Guitar Institute. Lessons take place weekly at set times and days. WAs an aspiring Rock guitarist seeking courses in London, you have shown an interest in improving your craft. If you want to push yourself to the next level, even the professional level, you should have the best training available. We look forward to working with you. Become a proud member of the London Guitar Institute, and we will help you become the Rock guitarist you want to be. Contact us for more info about our rock guitar lessons. We promise a prompt and personal reply within 1-2 working days. Are you a beginner looking to learn rock guitar in London?